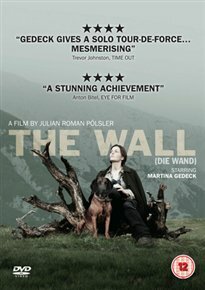 Gedeck plays an unnamed Austrian woman who goes to a secluded Alpine hunting lodge with her cousin (Ulrike Beimpold) and the latter’s husband (Karl Heinz Hackl) who, shortly after their arrival, decide to visit the nearest village. When the couple does not return the next morning the woman sets out for the village and discovers an invisible wall, behind which there appears to be no sign of life. The wall now separates her from the rest of the world. Left behind with a dog, a cat and a cow, she must try to survive alone in the forest. She keeps a record of her thoughts, her fears and the hardship she suffers although nobody might ever read her outpourings. Martina Gedeck’s outstanding performance brings the role to a rare and vivid intensity.